Lucy starts her sophomore year with a plan—to lose her virginity to her boyfriend Alex. Alex also starts the year with a plan—to break up with Lucy. Embarrassed and broken hearted Lucy meets up with three strange classmates who claim to be able to heal her heart but only if she can get a guy to fall in love with her and break HIS heart within seven days. At first Lucy balks at the plan, but then she gets the brilliant idea that she will use the magic the girls promise her to get Alex to fall in love with her again and hold on to him for good. Things do not quite work out the way she plans in this paranormal romance. Although the backdrop of the book is magical, Lucy learns some real life lessons as well. She starts the week very naïve and insecure, but by the end of the seven days she has realized that love does not mean being someone’s biggest fan and always trying to please him. Lucy becomes a much more independent and powerful girl. 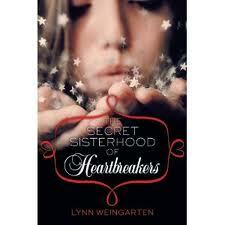 The story starts slow but picks up speed quickly and the three girls—the sisterhood—are interesting characters. They are much more mature than Lucy and their lack of parental involvement leads to a lot of drinking, cursing and late hours. Nothing is out of character and the language makes sense for the story, but it makes this a definite teen and not tween book. Looks interesting, I have never heard of this book before, but I might have to pick up a copy. Thanks, looks like an interesting romance high school novel.